Thankfully, I found one: Jim Hoffman had apparently cached an older version of NIST’s FAQ on his website. Apparently this version dates August 21, 2008. At the top, it shows the original source link of the cached version. The wildcard search in the Wayback Machine should have matched this page, but it didn’t. Either it was never stored, there was an error in the database or somebody made a request to archive.org for removal. It’s fortunate Jim Hoffman does so much caching: a good many of his cached sources are now unavailable anywhere else. Having been involved in software development, I know how to compare two text files to each other, showing the alterations between the two. This is part and parcel of VCS, or Version Control Systems. This post on 911blogger is an abridged version of the document I wrote on how I did it, including a list of all NIST's changes with criticisms. To read this full version, download the attached PDF. I recommend it. So, shortly after September 11th 2010, NIST, for whatever reasons, decided it should make some alterations to its FAQ. I was now ready to reveal them. To grease the process a little bit, I decided to use the graphical diff utility “P4Merge” from the free utility “Perforce”. Here's how it looks. 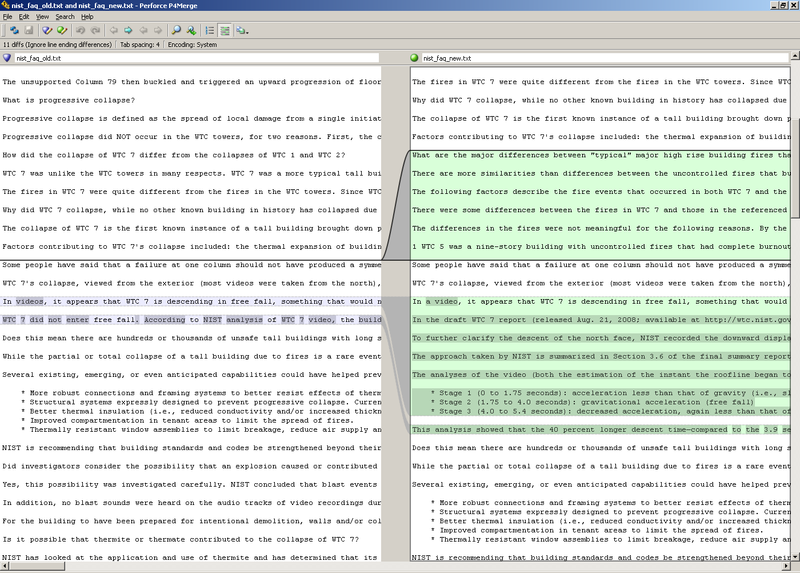 To the left is the old WTC 7 FAQ, to the right the new version. Since there is a considerable time gap between Jim’s cached version from 2008 and NIST’s current version I can’t know with certainty if the changes I report here were actually made on September 17 2010 or earlier. Nevertheless, at least one of the changes must have been. To confuse matters further, the last line claims the page was “Last updated: October 5, 2010”, conflicting with the date in the headline, and moreover was created “April 21, 2009”. The latter is unremarkable: the new extension of the new FAQ page (cfm) probably indicates some kind of web server update or migration. Keeping all this in mind, I summarize all alterations below. There are more similarities than differences between the uncontrolled fires that burned in WTC 7 and those that occurred in the following buildings: First Interstate Bank Building (1988), One Meridian Plaza Building (1981), One New York Plaza (1970), and WTC 5 (2001). WTC 5 was a nine-story building with uncontrolled fires that had complete burnout on a number of floors and partial collapse on four floors. The last line appears to be a footnote, although it probably doesn’t appear in the format NIST had in mind. I have identified and altered the number in the citation location to superscript in brackets, and the number in the footnote itself to include brackets as well. In videos, it appears that WTC 7 is descending in free fall, something that would not occur in the structural collapse that you describe. How can you ignore basic laws of physics? WTC 7 did not enter free fall. According to NIST analysis of WTC 7 video, the building collapsed 18 stories in 5.3 seconds. If the building exhibited free fall, this process would have taken just 3.9 seconds. The actual collapse time exceeded the free fall time by 40 percent. Why did NIST model the sprayed fire resistive material (SFRM, also referred to as fireproofing) on the WTC 7 beams and columns as a “perfect” installation (i.e., without any gaps or damage in the SFRM coating), when realistically most buildings have some gaps or damage in the SFRM coating, either due to improper installation or deterioration over time? NIST carefully considered the condition of the SFRM installation in WTC 7, including the applied thickness and evidence of gaps or damage in the SFRM. The SFRM in WTC 7 was modeled as undamaged except in the southwest region of the building where there was debris impact damage. A uniform thickness equal to the specified SFRM thickness was used for the finite element thermal analyses of WTC 7 because 1) the variability in the SFRM thickness was small, 2) no evidence of significant damage to the SFRM was found, and 3) small areas of SFRM damage would not have affected the thermal or structural response of the structural framing system. Again, the last line appears to be a footnote, and I have again identified and altered the place of citation to superscript in brackets, and the number in the footnote itself to include brackets as well. Why is NIST studying the collapse of WTC 7? How can I provide comments on the report? surface mail to WTC Technical Information Repository, Attn: Stephen Cauffman, NIST, 100 Bureau Dr., Stop 8611, Gaithersburg, Md. 20899-8610. Instructions for submitting comments are available at http://wtc.nist.gov. The final report is strengthened by clarifications and supplemental text suggested by organizations and individuals worldwide in response to the draft WTC 7 report, but the revisions did not alter the investigation team’s major findings and recommendations, which include identification of fire as the primary cause for the building’s failure. Besides reactive, NIST’s communication department is increasingly proactive and preemptive. The subtle change of the plural ‘videos’ to ‘video’, in reference to footage said to demonstrate freefall acceleration may indicate that NIST is keeping tabs on ongoing technical 9/11 research. The choice of topics altered or added reveals priorities: IC911Studies, accusations of FOIA obstruction and evidence tampering, comparative high rise fires before and on 9/11 that did not result in full collapse, fireproofing, and, of course, the freefall conundrum. I haven’t been able to pinpoint exactly what change(s) to the FAQ were applied on September 17, but it stands to reason that NIST expects increased website hits around 9/11 each year, and that some kind of publicity for 9/11 Truth triggered a response. regarding NIST's attempt to back-peddle on the observed free-fall acceleration, can you tell me whether their graph showing acceleration at g=9.8 m/s**2 for 2.25 seconds (over 100 feet of free-fall) appears in their latest report? I don't see how they can back away from that published graph -- which is so telling regarding what really happened to WTC 7. ProfJones on Thu, 12/02/2010 - 10:44am. That's just when they changed it from "WTC 7 did not enter free fall" back in '08 to "Stage 2 (1.75 to 4.0 seconds): gravitational acceleration (free fall)", shortly after Chandler called them on it. Having reviewed the FAQ recently, I'm fairly sure the other modifications are new. Pavlovian Dogcatcher on Thu, 12/02/2010 - 2:24pm. The research about this @ the 9/11 Forum is ongoing, and I have a feeling NIST might be watching. This research contradicts the NIST report, but it also contradicts our own research. To what extent, is yet unclear. In some graphs I miss the expected effect of the explosion heard in the new CAM #3 video... one would think this event (which implies a causal relationship with the collapse of the Penthouse) would turn up in graphs of the building's horizontal/vertical movement. P.S. you may want to have a look at this, too...although you might be aware of it already. SnowCrash on Thu, 12/02/2010 - 2:33pm. "This free fall drop continued for approximately 8 stories or 32.0 m (105 ft)..."
tanabear on Fri, 12/03/2010 - 12:21am.
" To my knowledge, there is no alternative for the Wayback Machine." I bet that NIST still has the older versions and that they would give then to you in a few weeks with a simple FOIA request. bofors on Thu, 12/02/2010 - 12:14pm. SnowCrash on Thu, 12/02/2010 - 2:37pm. "(Moreover, I'm not a US citizen, I don't have any money and no legal expertise)"
This has nothing to do with trusting NIST per se and none of these things are required. In addition to requesting the complete history html file history of the FAQ page, you should also request "any and all" documents, papers and files specifically including email that proposes or discusses any change to the FAQ page. bofors on Thu, 12/02/2010 - 2:57pm. SnowCrash on Thu, 12/02/2010 - 4:15pm. TomT on Thu, 12/02/2010 - 2:28pm. If we plot a graph of alterations to the WTC7 official story over time will it too have a period of freefall, I wonder !? Douglas Hilton on Thu, 12/02/2010 - 9:22pm. "The analysis showed there is a difference in time between a free fall time-a free fall time would be an object that has no structural components below it. And if you look at the analysis of the video, it shows that the time it takes for the 17-for the roof line of the video to collapse down the 17 floors that you can actually see in the video, below which you can't see anything in the video, is about 3.9 seconds. What the analysis shows...and...uh...the structural analysis shows, the collapse analysis shows that same time that it took for the structural model to come down from the roof line all the way for those 17 floors to disappear is...um... 5.4 seconds. It's...uh..., about one point...uh...five seconds or roughly 40% more time for that free fall to happen. And that is not at all unusual because there was structural resistance that was provided in this particular case. And you had...you had a sequence of structural failures that had to take place and everything was not instantaneous." This video and transcript were also removed from NIST's website. Their computer model does not show the 2.25 seconds of free fall acceleration and at no point are there no structural components beneath the roofline. Their original FAQ might have been somewhat consistent with their model(though not with reality) but their updated FAQ is not even consistent with their model. It's not surprising that they want to make this information difficult to come by. tanabear on Fri, 12/03/2010 - 12:04am. In my opinion the camera person appears to be looking for surveillance cameras, among other things. Was wondering what others notice ? penguin on Fri, 12/03/2010 - 11:19am. some observations, the camera man seems to film street names and signs, and then panning up and down the same building. If this sort of video was found in the hands of a terrorist, well.. you know. It would look like a terrorist surveillance video. I have no idea why this video was taken or why it was included in NIST's FOIA database, but it may have helped NIST with scene orientation? That still doesn't settle the issue 'why' though. As for this article, I emphatically encourage people to download and read through the PDF document, specifically the section "Discussion". I gave several logical problems about WTC 7 some extensive thought, and I will be following up on those at some point. I also attempt to analyze the intentions of the NIST researchers, why they make certain comments, why they include or exclude certain things from the FAQ, et cetera. For those relatively unfamiliar with NIST's report on WTC 7, it could be considered a small primer. I owe inspiration and gratitude to the folks at The 9/11 Forum (where debunkers and truthers meet, civilly) for their scientific research and insights. SnowCrash on Fri, 12/03/2010 - 2:54pm.